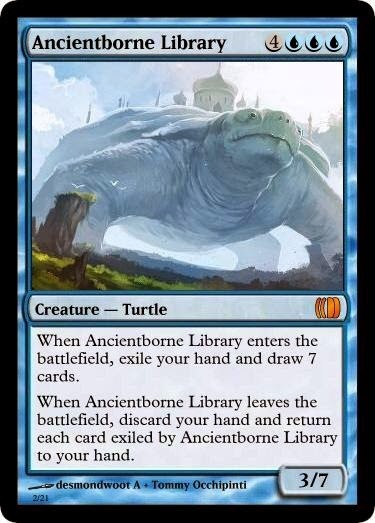 Reminiscent of Memory Jar, but significantly different, Ancientborne Library is a neat story, and not a bad looking card in terms of gameplay. 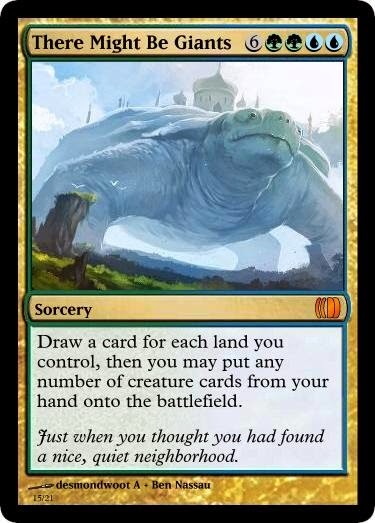 Funny how the 3/7 body is more relevant as a clock or when(/if) you get your old hand back than as a giant creature (though it absolutely matter in Limited). 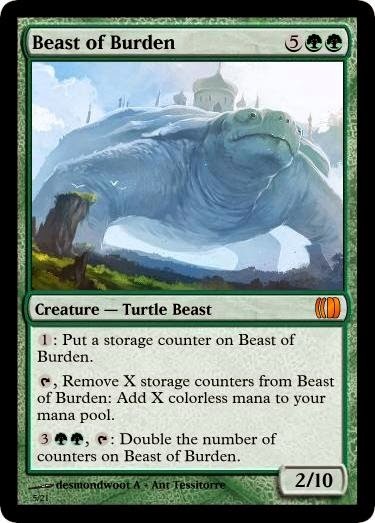 I love the idea of a Green Mana Battery creature, but it's cruel to put mana acceleration on a 7-drop. That's the slot where players want to be dropping haymakers, not building up even further. That said, this could produce enough mana to Fireball everyone in a Commander game after just a few turns, so it's not without value. Make a four-mana Beast of Burden, though, and a lot more players get to enjoy it too. 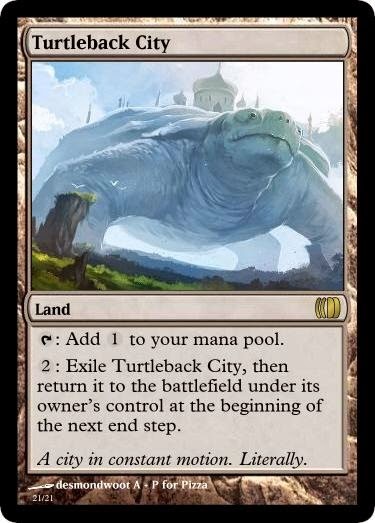 It's unfortunate that players will compare Cityback Tortoise to Primeval Titan, because this has better flavor and really isn't a bad card. It won't dominate Standard, but as an uncommon should do real work in Limited. Coming Doom reads the art a bit more abstractly, but it does manage to be the only black submission. It puts a slow, but inevitable clock on the game. 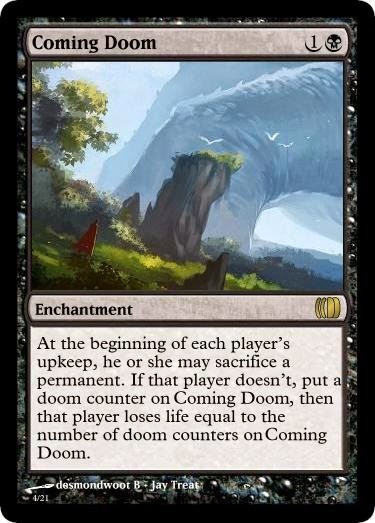 It's symmetrical but easily twisted in favor of a player who can generate a lot of extra permanents and/or gain life. Gondagar is one of our bolder submissions, creating token creatures that can be attacked like a player or planeswalker, not to mention the otherwise unkillable legendary turtle. Having to kill his legs first is very unique; feels like a boss creature in a scrolling video game, which is neat. The legs started out as 0/3 and I liked them better in that more substantial form. This thing is mythic after all. 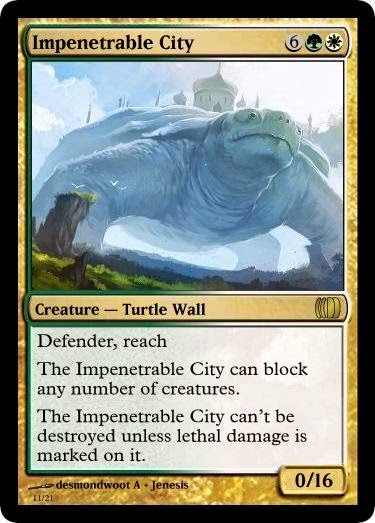 Impenetrable City is the uber-wall. It can block any and all of your blockable creatures and is immune to most removal. I think it's a problem that this can stop an army of six 3/3s or two 15/15s with just a little help, but then again, an 8 mana rare wall that doesn't kill anything is going to have to be pretty impregnable. Incomprehensible Landscape is one of our more unique submissions, enabled in no small part by a fairly sideways interpretation of the art (not a bad thing). I like that it gives utility to your extra lands, though I'd want more immediate impact from a an aura I can't use before turn 5, perhaps counting lands in play. For flavor, it's tempting to give -X/-0 to the attacking team, but even X=2 gets pretty devastating, so it was smart not to go that route. 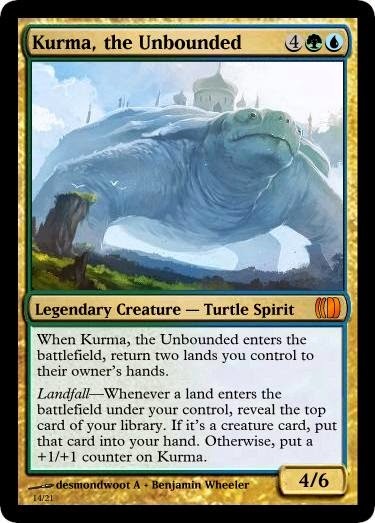 Kurma gets you creature cards or +1/+1 counters based on land-drops, and it guarantees two of those. Any two parts of this card go well together, but there all together it just feels like a random collection. Maybe Creative could write a tale explaining it all, but it's a big flavor hit when the story isn't self-evident. 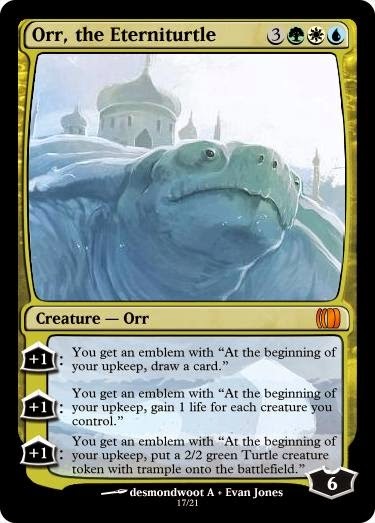 Orr is a giant planeswalking turtle with a city on its back. 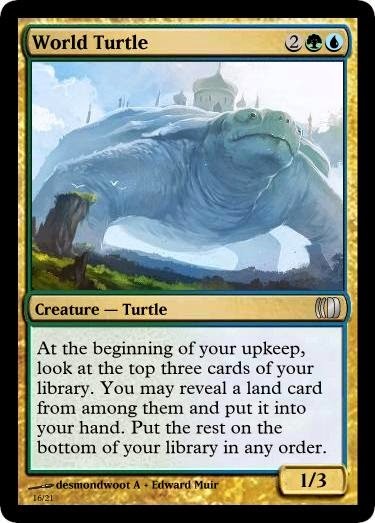 While it's hard to imagine Orr with the same spark as the other planeswalkers, I have no trouble believing this turtle entity can swim through the blind eternities and/or hop from one plane of existence to another. And that's awesome. All its abilities being +1s, showing this eternaturtle only ever grows older and wiser and bigger, is also highly thematic. Ignoring development issues like the very high power level of this card, I have two big design concerns. First, emblems are noninteractive and so even when your opponent kills this immediately after your make your first emblem, you're still drawing twice as many cards as they are for the rest of the game. Second, none of the 10 cards that make emblems ever make multiple types and only one can make an emblem immediately; Emblems are harder to track than life and trying to track multiple emblems at once—while just as possible—as working with banding and phasing together will always be cumbersome and will simply be too much for some players. Path of the Palace is another out-of-left-field design. It takes some noodling to figure out both how you'd use this in play, and how this story works, but there are answers and so I can see a small subset of players getting a real kick out of such a card. I do wish it did a bit more on its own. Peer Into the Distance doesn't do anything for the turn you cast it or the turn after, but it starts picking up quickly after that. It could probably cost notably less, but I'd rather have it enter with a counter so it's relevant sooner. Significantly different from other entries. Ponderous Palisade managed to be the only traditional "manland" which is a nice get. It becomes a sturdy Stealer of Secrets which I can kind of buy for this art. Neat. Slumbering Ancient plays with the usual one-turn-only "manland" and gives it a different end condition. I'm not entirely sure why this ancient falls asleep whenever a creature comes around—maybe it's scared and hides in its shell, but I'd be more afraid of attacking creatures than entering ones. Even though R&D doesn't use shroud anymore, it really does have uses over hexproof, and this art is clearly shrouded, so while I'm not sure that would make it to print, I support the bid. We really don't know what conspiracies will look like, or how they'll work, but Stand Among Giants takes a stab at it, suggesting they'll be multiplayer bargaining chips of a sort. I worry that by making all their creatures the same size, and leaving yours presumably smaller, you're making yourself a bigger target than the others, but I do imagine the saproling player will want to keep you undamaged until he can win outright. This can't not win the differentest award. They Might Be Giants draws you a lot of cards, and then puts every creature you had or drew into play, which is a huge effect for a huge mana cost. Hard not to compare to Omniscience, which also lets you dump your hand for 10 mana but doesn't draw you any cards. Both cards suffer from diminishing returns since anyone with then mana to cast them could probably just hardcast their hand anyhow, but the draw on this one makes it a lot more like Nissa Revane's ultimate or perhaps Tooth and Nail. This is an impressive card, but I can't help but notice it could have been 2 impressive cards if these effects were separated. Bonus points for finding a design different from all the others, that nails the art all while being a reprint. Tread New Ground suffers a bit from the use-mana-to-get-mana problem from Beast of Burden or Boundless Realms, but again, there are formats where that works. The flavor's actually pretty good if you think about it. 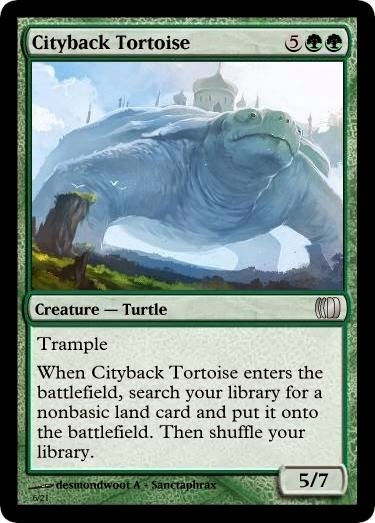 It's a little hard to imagine this Turtleback City moving quick enough to dodge Stone Rains and the like, but the last thing this design needs is a sorcery-speed clause. This seemingly pointless ability will vex a lot of players, but like Goblin Test Pilot, it's great for Vorthos, and Johnny can use it to trigger landfall three times as often. Not sure what set we'd want this in, but maybe Zendikar 2.0? It's a turtle, check, and it will help you see the world, check. Sometimes obvious is exactly what the set needs. Not to mention this is better at keeping your land flowing than Courser of Kruphix, even if it has a much less efficient body. "It's turtles all the way down." World Turtle keeps coming back no matter how you kill it (but you can exile or Pacify it). It'd be strange to see a mono-black turtle, but this ability feels quite black. Regardless of color, it's a very very resilient creature. That's the appeal of the card, though, and we don't want to lose that, but we probably want this to return tapped, or wait a full round just so its possible to get rid of it for one upcoming combat step before it comes back blocking all day. Ao is a zero-mana Exploration for any deck that wants it. If that turns out to be printably balanced, we still have to question whether we want to bleed this green effect into colorless, and on a card that costs just two lands being tapped that might not otherwise. This pair of effects go together like chocolate and peanut butter, but they desperately want to live on a green enchantment for my money. If the flavor is that this land is half-turtle and goes around pooping more lands, that's magical and ridiculous and I love it. A number of the designs ended up pretty similar to others (even the design immediately preceding them) but I'd rather see an interesting or good design that strays from the challenge than a boring and ugly design that follows it to the letter. And, we got quite a good bit of very out of the box designs, more than usual, and that's a win for everyone. If the goal is to share and learn—and it is—then this was one of our better challenges. On another note, I'm finding that giving feedback during the challenge and writing the review afterward is both a lot of work, and sometimes repetitive. I enjoy them both, but was lucky to have enough time to get this out by Tuesday evening. It's a bit too much and we want to be wary of overextending ourselves where we've made commitments because that leads to burn-out. I don't want to burn out doing this, I want to keep it going. So, I'm opening up discussion: If you have suggestions how I can keep WAC going with a less brutal time commitment on my end, I'd love to hear them. If the only solution were to choose between offering feedback or doing the review, which would you miss more? I'd vote for a wrap up and comments on the master thread. The card by card renders are cool, but a bit repetitive. As long as every card receives feedback, a highlight reel is all that's needed. Enchanted land does not untap during its controller's untap step. 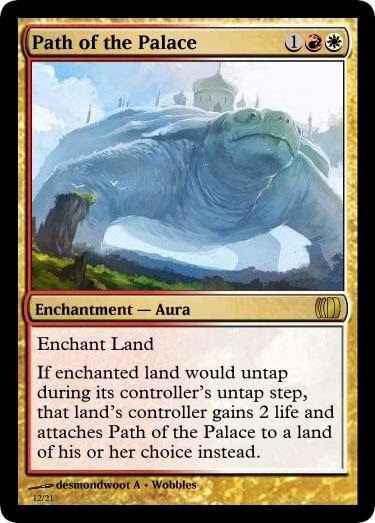 At the beginning of your upkeep, enchanted land's controller gains 2 life and may attach Path of the Palace to another tapped land. I'm with Wobbles. The renders are nice, but I'd prefer the feedback from everybody. A lot of people submitted World Turtles! Looks like mine got lost in the mix. Sorry. More likely when names match exactly. Fixing now. We all missed the opportunity to design Turtle World (Enchantment). 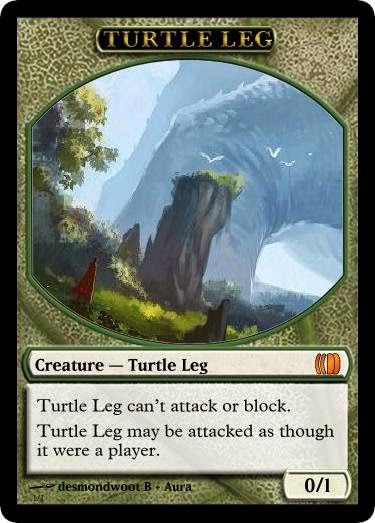 All creatures lose all abilities and are 1/4 Turtle creatures with ninjitsu. Creatures on the battlefield are Mutant Turtles in addition to their other types. I can't blame you for only wanting to do one. Just last week I was thinking "wow, it would be fun to lead a Weekend Art Challenge" followed almost immediately by "Oh god, I'd ahve to do all the renders, screw that!" So, you have my full support on dropping one, and I think the wrapup with the renders is definitely what I would vote to lose! I think the problem with that is it requires a lot of playtesting. At least in my case, my playtesting time is pretty much entirely eaten up by development of my own game. I don't know for sure, but I suspect most people here aren't anxious to do much playtesting either (no where near the amount that really making this kind of game takes). The playtesting problem has been a recurring problem for me. I've kind of hit a wall with Suvnica where the natural progression of the project wants us to choose guild mechanics, which requires playtesting. Hopefully, I think we've stumbled on a solution that will help with playtesting both in Suvnica and in Tesla. More details possibly to come soon. I would love if we had a challenge to design a booster pack over 15 challenges, card by card, for a fictitious set. Even without playtesting—if we were just filling the initial common list out, for example—we'd still have to choose which submissions make the cut and which don't, which is more judgment than I've been happy doling out. That said, it could be mighty interesting. Tesla is Jules' baby now, but I do have an idea for at least one WAC from this. Week 1: Design a red common creature showcasing one of the 2 new mechanics of the set we are based on. Here is the art, go. Then after feedback, present you 3 favorite cards, do a pool. Week 2: Design a common green enchantment that hoses flying that fits this art. In the set we already have (the card that was voted on last time). Go. FWIW, I like the renders too. I do think that the feedback over the weekend is much more valuable (incremental development trumps a single critique without further opportunity to follow up), but having the final submission discussed in the larger context of the challenge and other people's submissions does give a great alternate perspective than the feedback doled out over the weekend. Personally I would miss either one. I believe that the renders and the combined discussion is a very good idea to have. a) I could do the renders, upload them on google drive and Jay only has to put them on the blog and comment. b) We shift this to a google groups thing, where we have more control on the comments and discussions, and anyone who makes his own render can attatch it to his comment. c) ask for people to prepare their own render through MGE. Some sort of Multiverse presentation of comments may spread the load a little, but that also depends how it's implemented exactly. I too think the renders are awesome, but image-wrangling is definitely time-consuming. I personally would be willing to render mine from here on out. FWIW, I have Magic Set Editor and could do some renders as long as someone instructs me on how to upload them to the site. I think putting the comments on the submission thread is fine... but it is nice to see the mock-ups. alternately we can certainly deal with peer review until the final day. The good news is that we don't have to commit to anything blind. We'll try out a few new models and see how they go. Given that I've been more and more busy on weekends, it makes sense to first try keeping the review but leaving all the pre-final-submission feedback to the community. Again, if that doesn't work well, we'll try something else. I'm sure many of us are happy to keep giving people commentary on their designs over the weekend! I still cant believe how close one of us got with using Dethrone.